Learn how to harness the Android’s media capture and playback capabilities in your applications. In this class, we will examine Android’s capabilities for developing applications that utilize the camera and microphone for photo capture and manipulation, sound recording, processing and audio synthesis as well as video capture. We’ll work our way through several example applications that utilize and illuminate these capabilities. In particular we’ll develop a custom camera application and extend to automatically create double exposures. We’ll create a an audio capture and playback application that allows us interactively to scrub through recordings. Finally we’ll create a video capture example and learn about how we can extend it adding effects such as solarization to the output. This hands-on workshop is suited for those with some previous Android development experience. 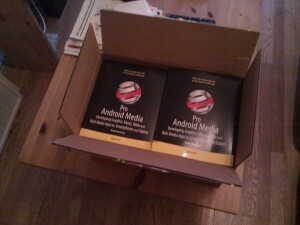 Please come to the workshop with a laptop running Eclipse and the latest Android SDK. 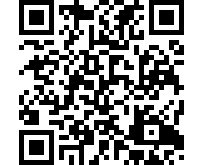 It would be helpful to have an Android handset that can be used for development as well (don’t forget your USB cable). 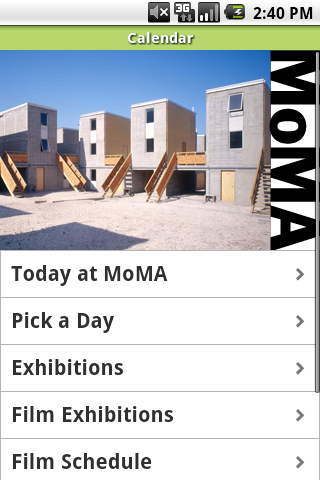 MoMA just unveiled their Android app which I built in collaboration with their digital media department. While I expect Nielson to say that, what I didn’t expect was that they would show mobile viewing on par with internet viewing. That is certainly suspect and looking a bit more closely at their charts it makes more sense. The top chart indicates that people watch as much on their mobile phones as they do on their computers. The second chart puts this in context, the number of internet users watching video is 131,102,000 and the number watching mobile video 13,419,000, 1/10th of the number. Taken across all of those users, the average monthly video viewing time on the internet is only 3 hours while the mobile user are up to around 3 1/2 hours. This seems pretty out of whack but then again, the top/first 10% internet viewers are probably watching 10 times that amount (I know I am with NetFlix, Hulu, BitTorrent, YouTube and the like), it seems out of whack because you are only seeing the power users on the mobile phone accessing video while you are seeing broad viewership on the internet. test post from my iPhone using WordPress..